Don't miss the BBQ on Wednesdays and Saturdays! Good meat, salads and vegetables. Perfect with a regional wine. Also if you are vegetarian we prepare special food for you, so you can share the dinner with the others. And if you are in other hostel don't worry! You can come anyway and enjoy it!! 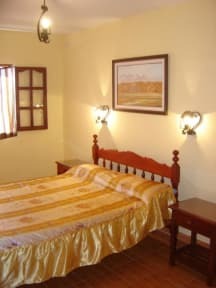 >> We have well-lit and ventilated rooms, 24 hours hot water and powerfull showers. Your room will be cleaned daily with fresh towels and sheets. Blankets are provided and we have central heating for winter. >>From 8 to 10:30 a.m breakfast is served to your table and you can enjoy an excellent coffee, fresh bread, homemade jam and butter. >>Everywhere many common areas .Lot of lovely courtyards perfect to relax under the trees listening to the birds, meeting new people and hanging out in the sun. >>There is also book exchange and free access to guide books, laundry service, free internet access, stable wi-fi connection, security box and after check out time we can store your luggage if you need it. 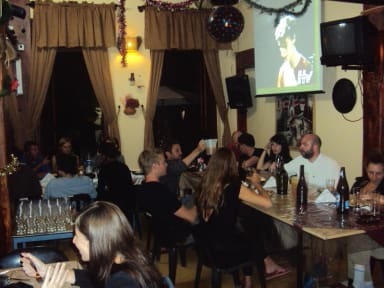 >> You can enjoy a welcoming bar area with ping-pong table, fossball, TV, big screen for sport events or movies. Also a very clean and equipped kitchen for guest use. >>We have 'empanadas salteñas' every night and drinks. >>Our friendly and helpful staff want to hel make your visit to Salta an unforgettable experience! They will be ready to help you with any question, plan or ideas, organising tours and taking care of all your need and wants every day, 24 hours, trying to make your stay as smooth and comfortable as you deserve. Salta por Siempre is not just a bed in a room.. It was a good hostal. Stayed 2 nights. Only the bed matras was really old so not too comfortable anymore. Besides that i had a teally good time. Towel offered by the hostal is a nice bonus. I noticed the tours they offered i slightly overprices if you would book at an agency in the centre or other hostel (hostel prisamata offered same prices as touropperators offered in the centre. Great people and nice common areas. Asado here is very nice to meet people. The building and the beds are a bit old, but clean. We enjoyed our stay very much! Good hostal. Vale for money. Helpful personnel. Wake-up call and calling a taxi for me was not a problem. It's not right in the centre, but close enough to walk. Shower was cold one of the two days I stayed there. Prima hostel, net iets buiten het centrum van Salta. Het personeel was vriendelijk en maakten ons wegwijs in de buurt (supermarkt, restaurant etc) Voertaal is Spaans. We waren blij met de mogelijkheid om kleren te laten wassen/drogen; 50 pessos voor een zak was. Ontbijt bestond uit cappuccino of thee en vers brood, in een tuin vol bloemen. Nice hostel for a good price. Nothing to special but definitely a decent stay. Nice place, bit far from the city center though. They do their best organising events (Asado,live music etc) which is a nice way to meet some fellow travellers. Get the four bed dorm, way nicer than the larger dorms as you have a lot more space. From the center to the hostel is about 30 min, for me it was too far. Also the hostel is located in downtown. The streets don't look nice, when you walk all by yourself, it's a bit scary. The hostel was very clean. Every day you get a new towel. The staff is friendly but doesn't speak English. The breakfast is every morning the same exciting of two crackers, marmalade and butter. + coffee or tea. Overall ok hostel.